Our country is divided over just about every issue under the sun. We live in a world increasingly hostile toward opposition of any kind while popular culture demands adherence to a fragmented form of tolerance that values total acceptance above mutual respect for differing worldviews. In his new book, “The Dignity Revolution: Reclaiming God’s Rich Vision for Humanity,” author Daniel Darling, vice president of communications for the Southern Baptist Convention’s Ethics and Religious Liberty Commission, argues we can tamp down some of that hostility by recognizing one another’s innate worth and value. For Christians, Darling told Faithwire, it’s important to relink the gospel message to the moral truths it promotes, chief among them the intrinsic and unflinching dignity of human beings. Faithwire spoke with Darling about his new book. It should be noted some of his answers featured below have been edited for both length and clarity. What inspired the book and why did you decide to write it now? Every generation sees assaults on human dignity, but I think in our generation, we see it more because we’re more aware of the news. It gives us an opportunity to speak out. My political convictions were formed and shaped by the pro-life movement. I think, more than anything, the pro-life movement has introduced a moral vocabulary into society by saying the most vulnerable among us, who can’t defend themselves — there’s a person there. It’s not a fetus; it’s not a clump of cells; it’s a person. What would that ethic look like if we continue to think about that across a wide range of issues? Jesus says to love your neighbor as yourself, so if we’re to properly love our neighbor, we should care about the world in which our neighbor lives. We should care about policies that shape our neighbor’s flourishing. How can we say we love our neighbor if we’re not speaking up for our unborn neighbors, or for our immigrant neighbors, or for our elderly neighbors, or for our minority neighbors who face racism and discrimination? In our political discourse, there seems to be a great lack of dignity. How can we restore some of that? I think we do it on a number of levels. I think, one, we need to remember whose we are — that we represent another king and another kingdom. We have to make voting decisions, we have to choose what institutions we’ll be a part of, what political parties we’ll be a part of. That’s just the way our republic works. But if we’re to be sojourners and strangers, as 1 Peter says we are, then we should never feel completely at home in any earthly movement. There should always be a little bit of dissonance, a little bit of discomfort — whether you’re a Republican or Democrat — with the overall party. Secondly, more importantly, even in the way we talk to each other, the rhetoric we use. Can we have robust disagreements about public life and yet consider the person who disagrees with us as a human created in the image of God [worthy of] dignity and respect? When we make arguments online, we’re not just arguing with an avatar. We’re having a discussion with a human being. God doesn’t just care that we make the right arguments and that we stand up for truth, but also in the way we do it. I can’t help but think about this in the context of #MeToo and #ChurchToo. What role do believers have in those movements? We’re seeing across Christianity a kind of revelation that some of our power structures, some of our institutions have not protected the vulnerable among us. You just think about the horrific child sexual assault that, quite often, our institutions have been more interested in protecting the reputation than protecting the innocent and the vulnerable. How can Christians practically walk the line of adhering to truth while also seeking to build bridges? The important thing is we need to let our faith shape our politics rather than letting our politics shape our faith. We are always being formed in some way and, too often, when it comes to our political theology, we’re formed by our influencers or by our tribes. You see this on the left and right with Christians. I think we need to be formed by the scriptures. We need to be formed by a kingdom ethic, which means sometimes we’re going to sound very, very conservative — almost out of step, especially when we’re talking about sexual ethics and the pro-life movement — [and] sometimes we’re going to sound more progressive even though we’re really not, when we talk about racial reconciliation, the dignity of immigrants, refugees. We need to let our faith and let the scriptures shape our politics rather than bending the Scripture around our movement or our politics. What did you learn writing the book and what do you hope readers take away from it? One of the things I learned in studying this idea of human dignity that just gave me so much more faith and trust in the Christian gospel and in the stories is just how robust and beautiful this Christian vision of human dignity is. 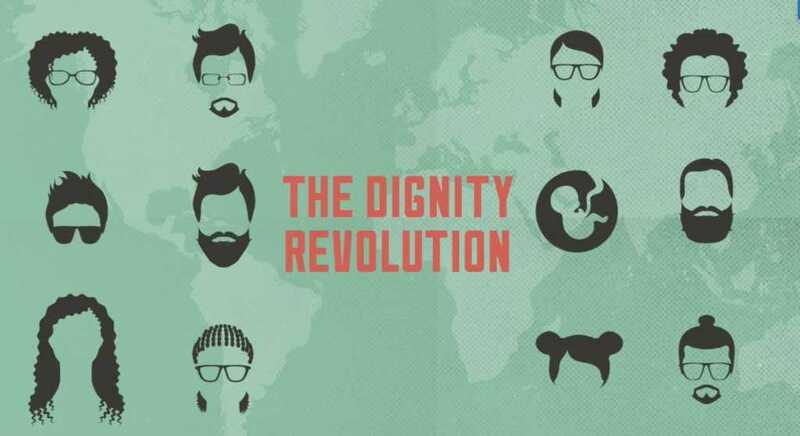 Human dignity is one of the best gifts that Christianity gives to the world. Without Christianity, you don’t have this robust vision of human dignity. The idea that humans are valuable is present in some other religions and other philosophies, but Christianity offers the most robust vision — not just for who we are as humans but also for how to fix a fallen humanity. What the first Adam could not do, Jesus, as the second Adam, comes in the flesh and he restores our humanity and we will one day rise again in new bodies with a perfect humanity. The Christian story, even if you don’t believe it’s true, which I hope you do, you wish it was true because it’s the fullest, most robust vision for human life.